This is my first Two Dollar Tuesday in a while and so I was super excited for this recipe. I love samosas, but don’t always feel like going through the trouble of frying them or stopping by an Indian restaurant. So I took the idea of a crispy outside and made it easier by making it in a quesadilla form. Boil the potatoes until soft and drain. Using a food processor blend the potatoes, vegetable broth, olive oil, garlic clove, curry powder, powdered ginger, ground cumin, and salt. Carefully mix the green peas into the potato blend and spread out evenly on two tortillas, then fold in half. Place a frying pan over medium-high heat and cook each quesadilla until each side is golden brown. For the chutney place all the ingredients in a food processor and blend, adding enough water to make a pesto-like consistency. 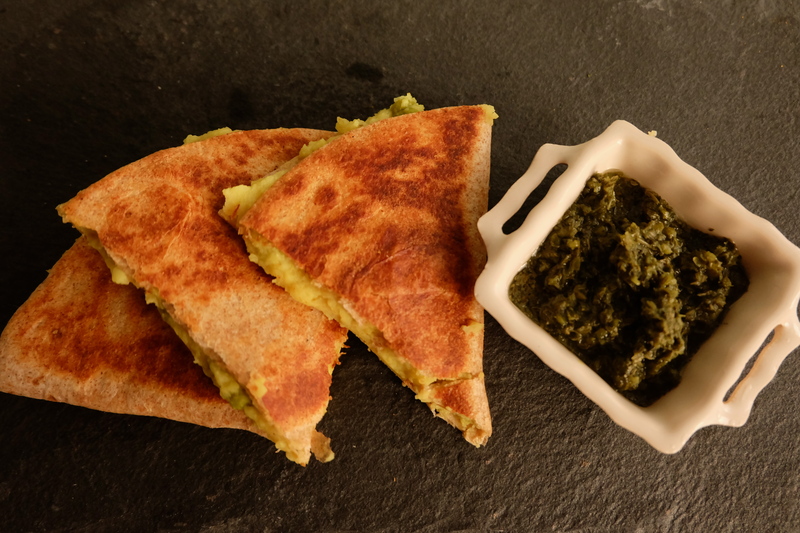 Cut the quesadillas, and serve with a side of the chutney.